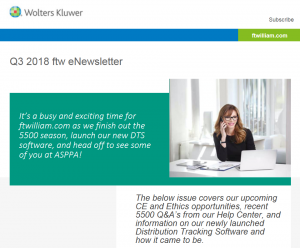 It’s a busy and exciting time for ftwilliam.com as we finish out the 5500 season, launch our new DTS software, and head off to see some of you at ASPPA! The below issue covers our upcoming CE and Ethics opportunities, recent 5500 Q&A’s from our Help Center, and information on our newly launched Distribution Tracking Software and how it came to be. Click the picture to read the full online version.